North Carolina’s jobless rate ticked up two-tenths of a percent to 9.6% last month. Figures released Friday by the state Division of Employment Security (DES) show the private sector added 16,000 jobs over the month. But local government job losses erased much of that progress, with 14,200 positions eliminated. “Given the trends we’ve seen over the last year, it is clear that increasing unemployment through government layoffs does not reduce joblessness,” said Alexandra Sirota, Director of the NC Budget & Tax Center. DES officials note one bright spot in the data is the fact that North Carolina’s current unemployment rate is 1.1 percentage points lower than a year ago, when the jobless rate stood at 10.7%. 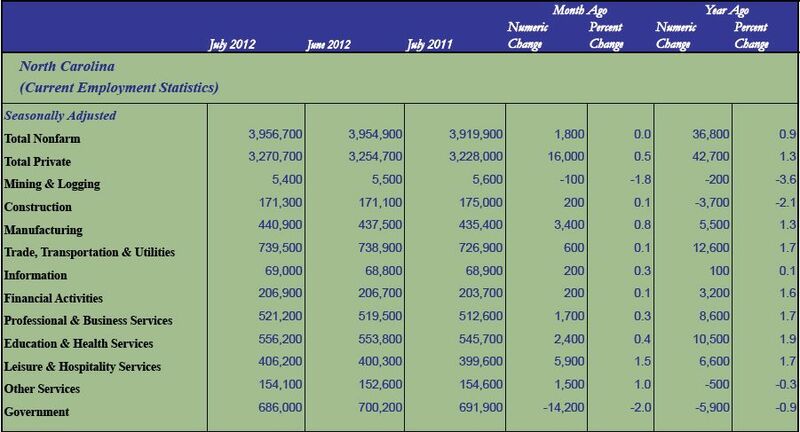 Chart: NC Division of Employment Security (DES). There is no bright spot in this news report. Many people have just dropped out of the work force, and there are less people working than 4 years ago despite massive deficit spending. More than 15 million people are out of work, and have little hope of finding anything. It’s a bleak picture, and will only get worse. I’m the eternal optimist and I believe the economy will begin to pick up after the presidential and gubernatorial elections elect more business friendly leaders. Recovery from the last GOP administration will take some time. I don’t think you’re young enough david if Obama gets another 4 years. We have $100 TRILLION in unfunded liabilities sitting out there, and the Obama administration wants to keep things like they are. This is so pathetic ! No wonder they’re putting a muzzle on Biden !. You are trading in what I call “political derivatives”, where you try to win regardless of the facts. When Obama reduces a liability you call it theft. When he increases it you call it a burden. It’s even absurd to say Obama wants to “keep things like they are”, as the outcry is resistance to his proposed changes. there are going to be a lot unemployed people marching in Charlotte @ the DNC. Obama has said he “will not rest” until everyone who wants a job can find a job. I don’t think he’s lost any sleep about it the last 3years. So when Republicans in NC run their campaign on the promise that if elected they would create jobs for North Carolinians and then when elected they didn’t where is the accountability? Evidently Republicans believe jobs can be created here at home regardless what happens in Washington so why blame President Obama for unemployment in NC? Republicans refuse to allow job creation to happen in NC. Why?? Instead of creating jobs, as they promised during their campaigns, Republicans like LaRoque was busy, according to the paper tail, filling their treasure chest with the people’s tax dollars because of a sense of entitlement. We don’t need smaller government we need Republicans like LaRoque out of our pockets. The Republicans have lied to the people. It’s time to through-the-bums out and elect people who can get the job done. A very feeble argument Jack ! Take a look at Utah (Republican) and California(Democratic) and how both states are faring in the bad national economy. We are trying to put the same thing in place as Utah, but it takes some time–low taxes, etc.but I think the state will eventually turn around . Utah is a backwater,with a population of 2.7 million and Cali is bigger than a lot of countries at 40 million, poor analogy. Look at the dismal record of Red southern states, that’s a better reflection of the effects of Republican policies. California was once a robust, high growth state in the 70’s, but 30 years of Democratic leadership have turned it into something that resembles Greece or Spain. State government is essentially broke with a $17 Billion dollar deficit, 3 cities have already gone bankrupt with more on the way, infrastucture is crumbling, education is among the worst in the nation and public universities are going downhill, utilities are saddled with excessive regulations with the highest rates in the country, taxes are sky high, entitlements out of control, and the state ranks 48th for business environment. The middle class is leaving the state, and crime is out of control.All of the current Democratic policies have been tried in California, and what a mess it is now. That’s the contrast I’m talking about. Three of the top seven Universities in the world are in California, deregulation of utilities pushed by Enron caused massive problems in California(read “The Smartest Guys in The Room), most of California’s budget crisis is from loss of revenue due to declining incomes, corporate taxes and other taxes from 2007-09 as a result of the recession. Because of it’s sheer size, California was affected by the housing bubble disproportionately. Texas ranks as the most business friendly state, least labor friendly state, terrible education, and has a deficit of 24 billion, larger than Cali’s, that’s the contrast I’m talking about. David, most of your post is BS, and you know it. It is what it is in California, and unfortunately you can’t sugarcoat it.